Hope you’re not sick of the “off-the-shoulder” trend, because at NYFW there was an abundance of collections that featured designs with exposed shoulders. I’m not over the “off-the-shoulder” trend yet, but I’m a bit annoyed by the overuse of the term “cold-shoulder” in blog posts and articles that feature the trend. Of course if I could come up with a clever, but not overused, term to talk about this trend, I would have used it in this post—so who am I to criticize! At any rate, I love these 2 shoulder-baring looks from Jason Wu’s Spring 2017 Ready-to-Wear collection. I’m a fan of Jason Wu’s structured, sophisticated and feminine designs. And as with most of his collections, there are always so many looks that speak to how I want to dress. I want to dress like this for work but I’m not sure if they’ll get the holes at my sides. I do love Jason though. A few years ago he had leather motorcycle jacket with tulle layered skirt knee length. I started wearing tutus to work for ever after that. I now have a half a closet full of them. Love the idea of pairing a tutu with a leather jacket. Pairing an ultra feminine piece with a contrasting piece like a moto jacket is a can’t miss combo. I found something and add a correction: It was a crocodile leather jacket with a pleated skirt. I adapted the look for tutus. Looking at these illustrations I now want a new wardrobe! I’ve learned something, each model is carrying an opposite colour purse to her outfit. I must remember that. I prefer the term off-the-shoulder instead of cold shoulder. The folds in the white slacks are soft and the ruffles on the black dress are gorgeous. The models have such a natural swagger. Excellent work Mikayla. Thanks so much, Joanna. I ready to go shopping too! I love these designs Mikayla, especially the strong contrast between the two off-the-shoulder looks. The black ruffled dress is so chic, and I adore the cut-outs. 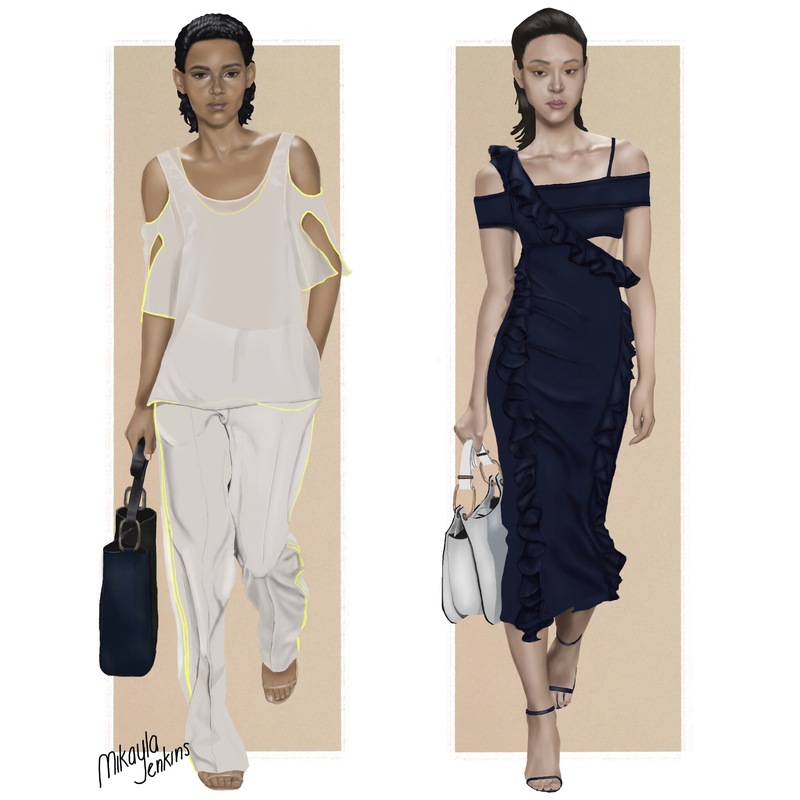 Your illustrations capture the elegance of these looks beautifully, and really bring the designs to life!